The smell of cinnamon and warm baked bread wafting from the oven is one of life’s pleasures and this recipe for classic banana bread is very easy to make and will be loved by everyone. To watch us make this recipe, click here. Pre-heat oven to 180 C (250 F). Peel and mash bananas. In a large bowl add all dry ingredients and make well in the middle. Add melted butter and egg and mix through. Add mashed banana and vanilla essence and mix thoroughly until batter has formed. Spoon mix in to a standard loaf tin lined with baking paper. Bake for approximately 50 minutes in oven until the bread is golden and cooked through. We like to check the bread at 40 minutes, particularly if using a fan forced oven, you can test if the bread is cooked by inserting a metal skewer in to the centre of the bread- if it comes out clean the bread is cooked. Allow to cool slightly before slicing and serving. This banana bread is delicious served on its own, with butter or with fresh berries and cream. It is also great for school and work lunch boxes. Enjoy! Click here to watch us make this recipe. Love baking? Click here for our Italian Olive Oil and Lemon Cake with Flowering Rosemary recipe and here for a delicious Orange and White Chocolate Cake recipe. Thank you so much! Glad you enjoyed it, it tasted delicious! 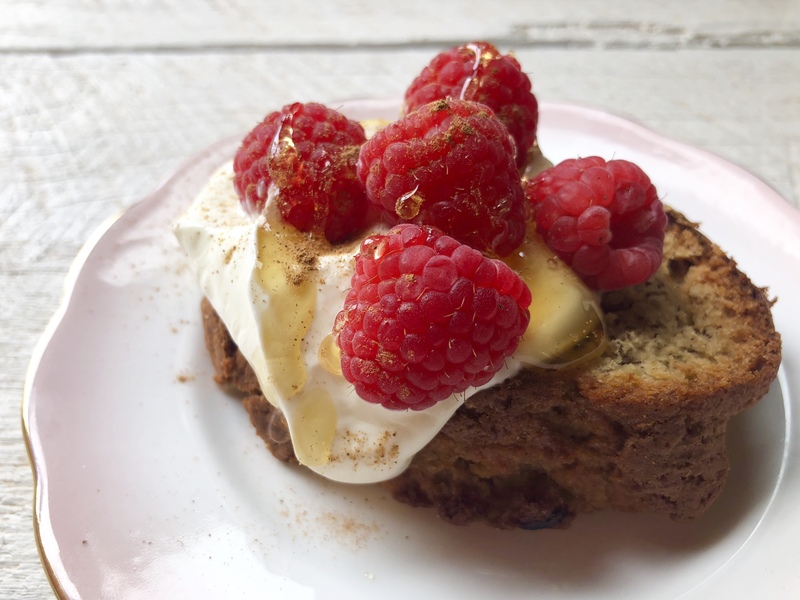 What’s not to love – banana bread and cinnamon – mmmmmm. I made this a few days ago and was so pleased with how it turned out! Love that there’s no sugar in it, apart from the natural sugar in the bananas. This is set to be my go-to recipe when I’ve got some ripe bananas to use up! 🙂 Getting geared up to start the holiday baking tonight! Great inspiration!